Storm King Art Center, with its 500 acres of rolling meadows and wooded groves, is arguably North America ’s most beautiful sculpture park. Just one hour north of New York City, its impressive collection has continually grown…and it just keeps getting better and better. Just when you think they’ve done it all, since their founding fifty-two years ago—like a magician pulling a rabbit out of a hat, they surprise us with Light & Landscape, a thrilling exhibition that smacks of magic mixed with a heady dollop of science, physics, and eco-awareness theme-based sculpture. There’s plenty here to satisfy exhibition goers who have a craving for the New. Deftly organized by Associate Curator Nora Lawrence, Light & Landscape features the work of fourteen artists “all who use a variety of strategies to engage with light as a central component of their work.” It was these very words, jumping off the page of their press release that compelled me to visit Storm King. I had to see how this beguiling premise could be successfully realized—both indoors and out—in sculpture, installation, drawings, photography, as well as video. Much to my surprise, they delivered a richer experience than I ever thought possible. The exhibition of twenty-five works are either part of the park’s permanent collection, on loan, or newly commissioned for the show. Light & Landscape, according to curator Lawrence, was inspired by Alyson Shotz’s stellar Mirror Fence (2003)—a 130 foot stretch of fence whose mirrored pickets reflect the viewer’s every movement, as well as the beauty of the park’s surrounding landscape. 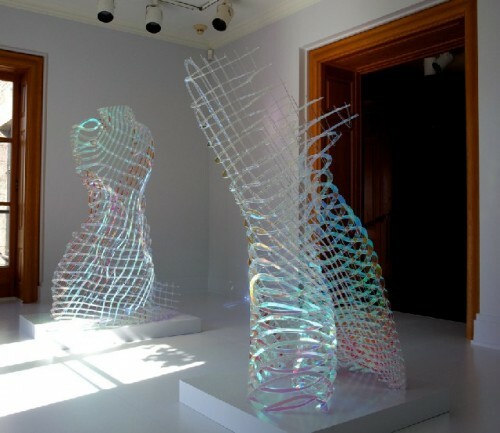 Playing with the effects of light are two of Shotz’s angulated, laser-cut, acrylic-ribboned sculptures titled Transitional Objects. Situated in a small indoor gallery, both works rely on light streaming through the gallery’s windows to bring the the spectrum of the sun’s hidden colors to life. Also using the sun’s rays to activate their creations are artists Katie Holton, Spencer Finch, and Peter Coffin. On sunny days, Holton’s outdoor, Sun Clock (Making Time) (2012) tells the time-of-day by using viewers’ shadows as they stand in front of one of the twelve monthly planet shaped markers. Timeline (A Light History of the Earth) (2012), situated indoors, is a Katie Holton constructed circular bookshelf. It measures 4.56 feet in diameter, relating to the earth’s 4.56 billion known years of existence. The bookshelf, itself, is filled with books dealing with the subject of light. Additional books on the subject of light, along with Adirondack chairs, are scattered throughout the park, for the visitors’ reading and resting pleasure. 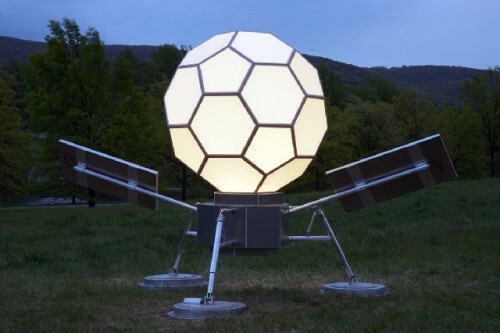 Lunar (2011), Spencer Finch’s solar powered geodesic dome, resembling an outer space-capsule that may have just landed in the middle of the meadow, depends, too, on the rays of the sun for illumination. Startlingly visible at night from the Thruway, after a full day of sun, during the day when the sky is overcast and gray it lights up partially. Delightfully unexpected – as many of the works in this exhibition is Peter Coffin’s Untitled (Bees Making Honey) (2012), a fenced-in area containing four active beehives. Though more an installation, than a work of art, in my opinion, the inclusion of live beehives does highlight the role that sunlight plays in the bee’s production of honey, as well as their navigational instincts unfailingly directing them back to the hive. The popularity of Finch’s geodesic dome and Coffin’s beehive installation have drawn the curious and brave, with the park’s early evening and weekend guided tours. Occupying Storm King’s largest gallery, Anthony McCall, Roni Horn, and Peter Coffin, each tackled the subject of light in a different medium. In Landscape for Fire, a 1972 video, Anthony McCall, using fire as the medium of light, sets a series of finely calibrated fires on a sports field at Oxford University . In Untitled (Weather) (2010-2011), a series of 5 colored photographs, Roni Horn captures the effects that subtle changes in varying weather conditions can have on one woman’s face. Resting on the floor nearby is Horn’s Untitled (“…it was a mask, but the real face was identical to the false one”) (2009-2010) a stunning sky-blue cube of solid, highly polished glass. 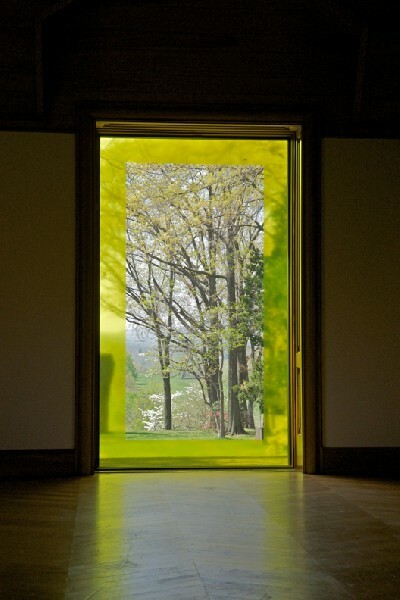 Casting a yellow shadow across the entire room, a clever strategy that connects everybody’s work in an enchanting way, is Coffin’s Untitled (Yellow Outline) (2008-2012), a solitary window covered by the artist with thin layer of yellow-tinted translucent Solex film. When seen from afar, the view from the window, which looks out over a stand of trees, appears to be a landscape painting – a very beautiful one at that. 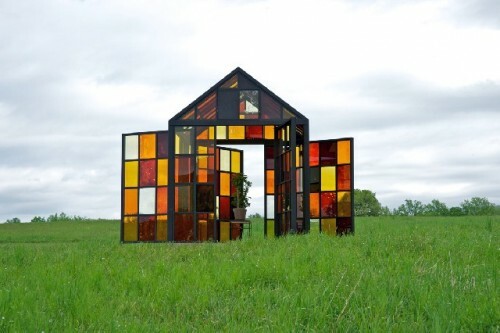 Isolated in the middle of a meadow, is Solarium (2012), William Lamson’s glimmering glass house composed of hundreds of small, variously-shaded amber panels of baked sugar, sandwiched between panes of glass. Like the distant, mysterious house in Andrew Wyeth’s Christina’s World, which captures one’s gaze brilliantly, Solarium, surrounded by a blue sky and an expansive stretch of green grass—all but demands— close inspection, both inside and out. Kaleidoscopic to say the least, the artist refers to the structure which houses a number of plants as an “experimental greenhouse.” Curator Lawrence notes “All plants create sugars through photosynthesis, those inside Solarium use light that has been filtered through sugars, affecting a circular process.” The science of botany aside, Solarium, when viewed from afar under the light of the sun – which is the artist’s intention- the structure would not seem out of place in a Disney cartoon, or that matter, a remake of The Wizard of Oz. Equally magical are the creations of Katie Paterson. In Streetlight Storm (2009) the artist uses Skype to connect the lanterns above the building’s two entrances to an antenna in Britain , which detects lightning from the Arctic Circle to North Africa , transforming its signals into transmittable data causing the lantern’s bulbs to flicker. In 100 Billion Suns (2011), a hand-held cannon, designed by Paterson , spews 3,216 pieces of confetti, each one representing the 3,216 times sunbursts photographed since 1960. Shot off once a day at 2PM, this fusillade of confetti is a celebration of creativity. And for those leaving the park after a wonder-filled morning a festive, it marks a festive Bon Voyage salute. Storm King Art Center is located on Old Pleasant Hill Road , in Mountainville , New York . Drivers with GPS should enter as a destination “ 1 Museums Road , New Windsor , NY 12553 .” Public transportation from New York City to Storm King is served by Coach USA , leaving from Port Authority Bus Terminal.